HomeLocal KnowledgeOlder PropertiesIs knob & tube wiring safe? April 24, 2018 Older Properties Comments Off on Is knob & tube wiring safe? 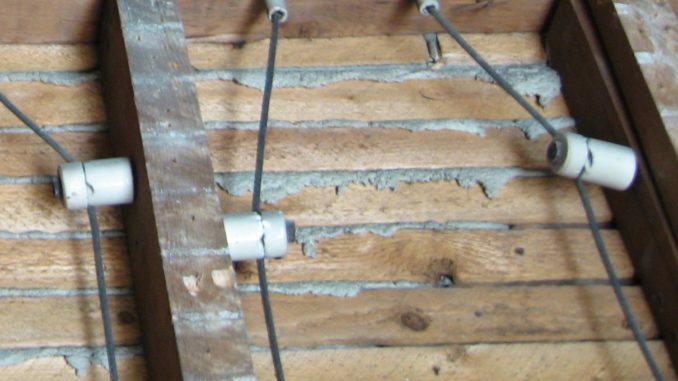 Knob and tube wiring -with open wires strung between insulators- was used in Ontario from the early 1900’s though the 1940’s. It’s not uncommon to find it in older homes where the electrics haven’t been upgraded. In fact, homes which have been upgraded can sometime have parts of the house still wired with knob and tube. Knob and tube is sometimes plainly visible running in places like basements. However, sometime the visible wiring in homes is updated, while still leaving some knob and tube runs hidden in walls. Modern wiring contains two conductors and a ground wire for safety. Because knob and tube has only two conductors, a house inspector can test outlets to determine whether there is still knob and tube wiring somewhere in the circuit. Many potential home buyers -and some realtors- are under the mistaken impression that the Ontario Electrical Safety Code no longer recognizes knob and tube wiring as an acceptable wiring method, and that all knob and tube wiring must be disconnected and replaced. According to Ontario’s Electrical Safety Authority, knob and tube wiring is safe, provided it is properly maintained by a Licensed Electrical Contractor and is installed in accordance with approved methods for open wiring. On the other hand, many home insurers are unwilling to insure a house with knob and tube, even if it is acceptable to the ESA.